Hello and welcome to the Doom of NineHands adventure campaign. This is a tabletop RPG campaign in the early writing and development stages. I expect to self-publish this campaign for use with the Dungeons & Dragons 5th edition rules, but until Wizards of the Coast publishes, or states the intent to not publish, an open gaming license we will just wait and see. This campaign is designed for 3 to 6 players beginning at 1st level and will end with the players reaching 15th level. This can be played with the basic 5th edition rules made available by Wizards here. If commercial and legal needs dictate I reconfigure the rules and stat blocks to follow the excellent Pathfinder 3.5 system, then it shall be done. THERE IS NOTHING FOR SALE HERE ON THIS SITE… yet. But please don’t send me a cease and desist letter, I am the smallest of potatoes. The story centers around the threatened city of Nineveh, the current capital of the once mighty Rolani empire. This bulk of the campaign takes place within the imperial capital and culminates in an epic siege battle against an invading army. The actions of the Heroes, and the results of the individual adventures will have a direct effect on how well the city can defend herself against the invading army, and weather the ancient empire survives or crumbles. The historical inspiration for Nineveh is Seventh century Constantinople. The capital of the declining eastern Roman empire nearly crumbled under the sudden emergence of a new religious and military force that we today refer to as Islam. Stay tuned for news about the coming beta test. 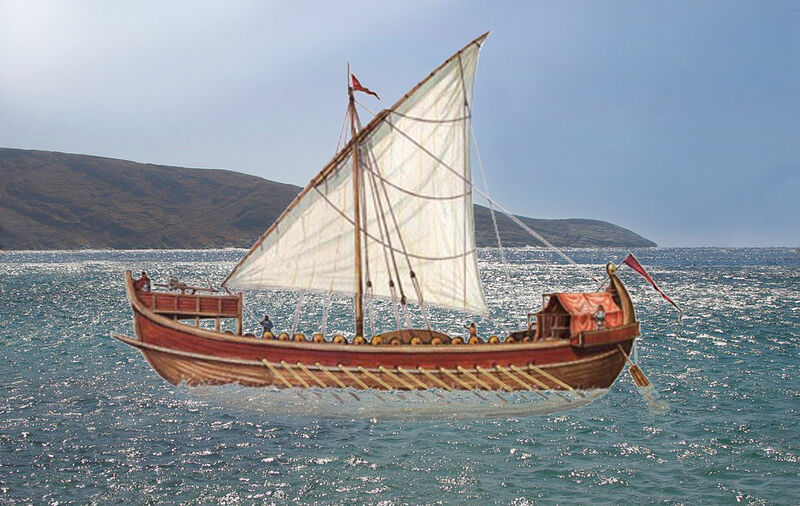 The standard war vessel of this period in the empire is the Dromon, a long and low ship of simple design. The Dromon is outfitted with, lateen sails and a single row of oars, typical 25 on each side. There is sometimes a single deck to protect the rowing crews from arrow or catapult fire. The front of the Dromon is equipped with a ram and some vessels have small ballistas or catapults mounted on the bow. The typical Dromon is 135 feet long and between 20 and 30 feet wide and crewed by 60 to 70 sailor soldiers.